You are going to Watch Naruto Shippuden Episode 299 English subbed online free episodes with HQ / high quality. Stream Anime Naruto Shippuden Episode 299 Online English sub The Acknowledged One. 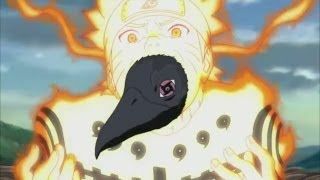 As Naruto fights to clutch onto his soul that the now-revitalised Nagato was attempting to remove from his body, Bee arrives at their location and attempts a surprise attack but it is foiled by the shared field-of-vision Nagato has with the Giant Snake-Tailed Chameleon and the King of Hell which had been summoned to store the young man’s soul. In the clutches of Nagato’s mechanical arms with a cannon pointing at him in point-blank range, the two jinchūriki are saved by Itachi and his Susanoo. Nagato, however, quickly regenerates and uses Chibaku Tensei with the intent of crushing his targets into the planetary body. 4.8 / 5 - 14 ratings.